BMW has unveiled the mid-life facelift of it’s new BMW 5-series in both Touring and Sedan form. It will begin production in March 2007. This update is more than just an aesthetic facelift though, the 5-series now has improved engines and some funky new technology. For one, all six-cylinder petrol engine powered BMW 5-series models now come with High Precision Fuel Injection, which is what BMW calls it’s Piezo crystal injectors. Piezo crystal injectors are more precise, delivering exactly the amount of fuel mixture at exactly the right time. Also, as a result of BMW’s Efficient Dynamics programme R&D, the new 5-series is now equipped with Brake Energy Regeneration, something that’s usually found in hybrid cars. The BMW 5-series is the first non-hybrid car to have any form of brake energy harvesting. Brake Energy Regeneration takes advantage of energy currently lost through the engine over-run during braking, using it to recharge a high capacity Absorbent Glass Mat battery. An intelligent alternator only engages and powers up the battery when required. It offers a 3% reduction in fuel consumption and emissions. 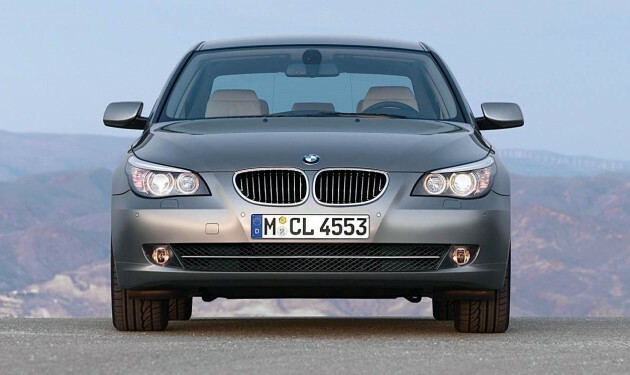 All models come with 6-speed manual as standard, except for the BMW 535d which has a 6-speed automatic as standard. But BMW expects the 6-speed auto option to be specified on most of the orders. This is the new 6-speed which uses upgraded hydraulics, and a better torque converter. This improves gear shift reaction time to the throttle pedal by 40%, which means nearly instant downshifts when you put the pedal to the metal. 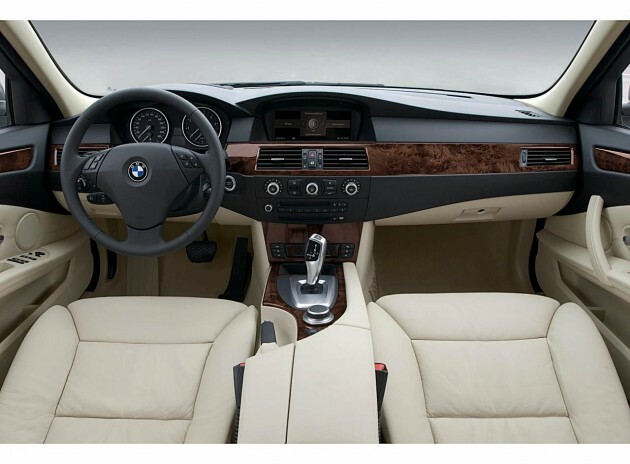 The BMW 530i, 540i, 550i, 530d and 535d also has paddle shift options. When it comes to fuel economy, the improvements are impressive. You can have a look at the numbers at the end of this post, courtesy of BMW UK Corporate Communications. For example, the new facelifted BMW 525i has 20% more torque, and 25.3% less fuel consumption than the pre-faceliefted model. Innovative equipment that can be specified include Head-up Display, Night Vision, Active Cruise Control, Stop and Go as well as a Lane Departure Warning System. The Lane Departure Warning System is interesting – a camera mounted next to the interior mirror monitors the white lines on the road ahead and, if the car crosses the line without obvious intent or without the indicator being used, the driver is notified by a vibration through the steering wheel (standard on 550i and 535d models – Â£350/RM2400 on other models). Active Cruise Control maintains a constant speed while monitoring traffic ahead, slowing the vehicle when another vehicle slows down ahead, while Stop and Go keeps the car moving a fixed distance from the car in front, even in slow traffic jams! On the outside, changes are subtle but noticable. The kidney grills now sit flushed with the bumper, while the headlamps now use clear glass. The air intakes are redesigned while the side sill has an additional countour line. On the rear, brake lamps now use horizontal bar LED lights to create an emphasis on the width of the rear. On the inside, door panels have been redesigned, and the power window switches are now integrated into the horizontal arm rests. The arm rests slope downwards though, I would much prefer an upwards sloping one like what Mercedes Benz has. iDrive has also been improved with the new 8 favourite shortcut button design. You also get BMW’s new shift by wire shifter first seen on the E70 BMW X5. Worldwide production will begin in March 2007, but it’s not known at the moment when we will get the facelifted model. Perhaps some of the CBU 5-series models will be facelifted first, as the volume sellers are being locally assembled here in Malaysia, and that takes time to prepare. BMW 550i: Eight-cylinder petrol engine with VALVETRONIC and Bi-VANOS, 4,799cc, max output 367 hp, max torque 490 Nm, acceleration 0-62mph 5.2secs (-0.3secs), top speed 155 mph (limited electronically), average fuel consumption 25.9 mpg (-2 per cent) (automatic transmission 27.4 mpg (-4.5 per cent)). BMW 540i: Eight-cylinder petrol engine with VALVETRONIC and Bi-VANOS, 4,000cc, max output 306 hp, max torque 390 Nm, acceleration 0-62mph 6.1secs (-0.1secs), top speed 155 mph (limited electronically), average fuel consumption 26.9 mpg (-4.7 per cent) (automatic transmission 29.1 mpg (-7 per cent)). BMW 530i: Straight-six petrol engine with second-generation High Precision Direct Injection, 2,996cc, max output 272 hp (+14hp), max torque 320 Nm (+20Nm), acceleration 0â€“62mph 6.3secs (-0.2secs), top speed 155 mph (limited electronically), average fuel consumption 36.7 mpg (-14.3 per cent) (automatic transmission 37.7 mpg (-24 per cent)). BMW 525i: Straight-six petrol engine with second-generation High Precision Direct Injection, 2,996cc, max output 218 hp, max torque 270 Nm (+20Nm), acceleration 0â€“62mph 7.1secs (-0.4secs), top speed 154 mph (+2mph), average fuel consumption 38.2 mpg (-17.5 per cent) ) (automatic transmission 37.7 mpg (-25.3 per cent)). BMW 523i: Straight-six petrol engine with second-generation High Precision Direct Injection, 2,497cc, max output 190 hp (+13hp), max torque 235 Nm (+5Nm), acceleration 0â€“62mph 8.2secs (-0.3secs), top speed 147 mph, average fuel consumption 38.7 mpg (-16.6 per cent) ) (automatic transmission 37.7 mpg (-24 per cent)). BMW 535d: Straight-six diesel with common-rail fuel injection and Variable Twin Turbo, 2,993cc, max output 286 hp (+14hp), max torque 580 Nm (+20Nm), acceleration 0â€“62mph 6.4secs (-0.1secs), top speed 155 mph (electronically limited), average fuel consumption 41.5 mpg (-17.5 per cent). BMW 530d: Straight-six diesel with common-rail fuel injection and variable vane turbocharger, 2,993cc, max output 235 hp (+4hp), max torque 500 Nm, acceleration 0â€“62mph 6.8 seconds, top speed 155 mph, average fuel consumption 44.1 mpg (-4.5 per cent) (automatic transmission 42.8 mpg (-13.5 per cent)). 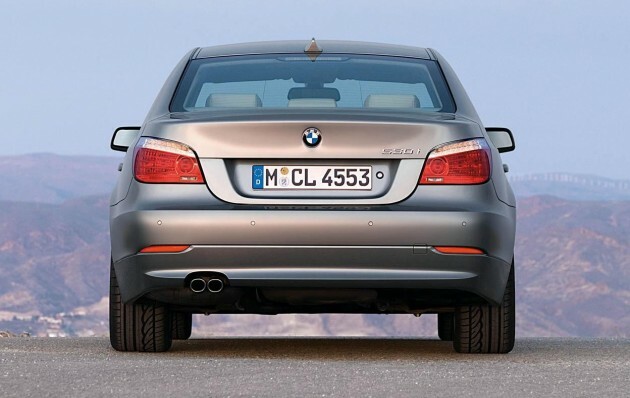 BMW 525d: Straight-six diesel with common-rail fuel injection and variable vane turbocharger, 2,993cc, max output 197 hp (+20hp), max torque 400 Nm, acceleration 0â€“62mph 7.6secs (-0.5secs), top speed 147 mph (+4mph), average fuel consumption 45.6 mpg (-11.5 per cent) (automatic transmission 43.5 mpg (-21.5 per cent)). BMW 520d: Four-cylinder diesel with common-rail fuel injection and variable vane turbocharger, 1,995cc, max output 163 hp, max torque 340 Nm, acceleration 0â€“62mph 8.6 seconds, top speed 139 mph, average fuel consumÂ¬ption 47.9 mpg (automatic transmission 40.9 mpg).